It was a long and arduous process, many a night was been spent weighing up the pro’s and con’s of everything from disk brakes to underpants, aptly, only one of those made the cut because the other did not. A common occurrence as you lose one item you often need to compensate by adding something else, the trick is to find a workable compromise that gives you what you need, balancing the fewest possible items with the lowest possible weight and pack size. Oh, and for the lowest possible cost. It’s not easy. In the end I came up with some simple criteria that helped to cut through the vast choice of products available, everything I bought had to be; reliable, durable and good value for money. I was also determined to keep the overall weight down to a minimum, not necessarily through buying the lightest components, just through buying only what is essential. The ideal components would be strong, light and good value for money, the reality is you have to pick two of those criteria and sacrifice the third. Components that are strong and light are expensive, components that are light and good value for money tend not to be strong, components that are strong and good value for money will be heavier. There is also a relationship between how much kit you take and the level of comfort you will experience both off and on the bike. 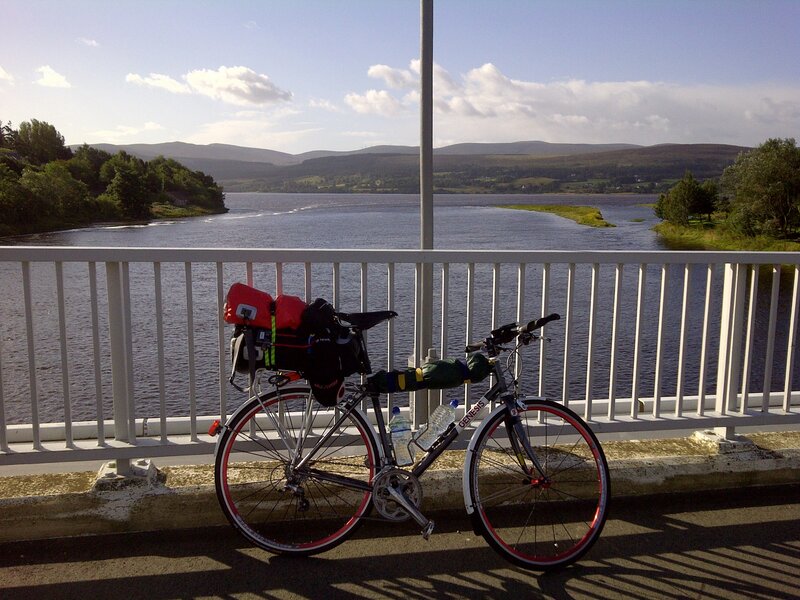 When I cycled from John O’Groats to Lands End, I had a pretty lightweight set up, somewhere around 18kg for the bike, camping equipment, tools, etc. This was ideal for making fast progress when on the bike, but meant camping was limited to shelter for the night, and I had to rely entirely on buying packaged food from shops, cafes and restaurants. The set up I chose to cycle around the world must afford more comfort when off the bike, I will essentially be living in a tent for around 85% of next four years, this will only be feasible with a few extras. I will need to take cooking equipment, clothes for hot and cold climates and have some spare capacity to carry several days’ food and water. I aim to fit everything into; two 20 litre rear pannier bags, one 20 litre dry bag and one 8.5 litre bar bag. I will also fit a front rack which will remain un-laden, most of the time, but serve as extra rack space to carry food, water and who knows maybe the odd señorita (mother would be pleased). As I gain experience using this kit I will add reviews to the blog. I will be having a trial run with the full kit in the coming weeks and will write a review of my initial findings. Feel free to contact me if you have any questions about the individual kit selections there are well researched reasons behind every choice I made, which I’m happy to share.